Emperor, "Il Grande Imperatore Di Tutti Micronauti." I don't care what anybody says, Emperor is definitely evil! Aren't all autocrats despotic by nature? This is the Micronauti version of Emperor. 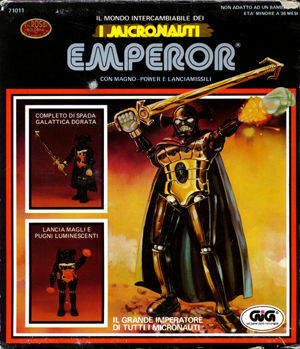 Emperor came later in the Micronauts line-up and one of the coolest things about the box is that it features original artwork rather than the somewhat tiresome action figure posing picture. The artwork seems to have been created by the same person who did the artwork for the aliens cards and alien vehicle boxes. This particular box also bears a red and gold sticker in the upper left from the Italian store that sold him. It reads "Filli Rossi - Bologna - via D'Azeglio, 13-15." Filli Rossi is the store name; Bologna the city; and via D'Azeglio 13-15 the address.